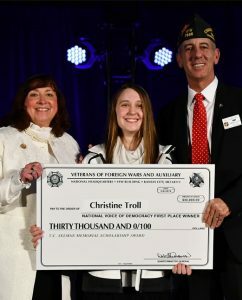 Other national scholarships range from $1,000-$16,000, and the first-place winner from each (state) VFW Department wins a minimum scholarship of $1,000 and an all-expense-paid trip to Washington, D.C.
VFW Post 9934 serves the area of the City of Dana Point, California, and other surrounding communities. In this area, contact VFW Post 9934 for additional assistance and a copy of the entry form. For areas outside of Dana Point, California, contact the local VFW Post. For locations of other posts, go to http://www.vfw.org/find-a-post. All entries competing at the Post level must be in the hands of that VFW Post by midnight, October 31, 2018. It is the responsibility of the student to meet this deadline by submitting their entry to the proper location.